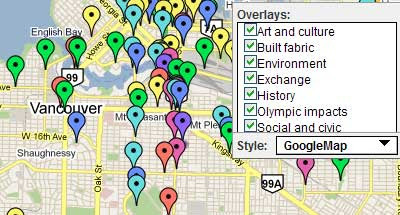 The Vancouver [de] Tour Guide 2010 is a mapping project that uses the Google Maps API to present an alternative to "the sanitized 'best place on earth' version the 2010 Olympics organizers are promoting worldwide". The map highlights a variety of locations, histories, and representations of the city and also seeks to record, collect, and transmit information such as the impact of the Olympics and other unofficial stories to visitors. I have a poor knowledge about the city. But thanks to this Olympic i gather many valuable information about the city. We appreciate your coverage of the map... we have had over 10,000 visits over the past two weeks and now have over 300 posts to the map. We intend to maintain the map after the five ring circus has left town. Best UK Google Map Mashup Ever?